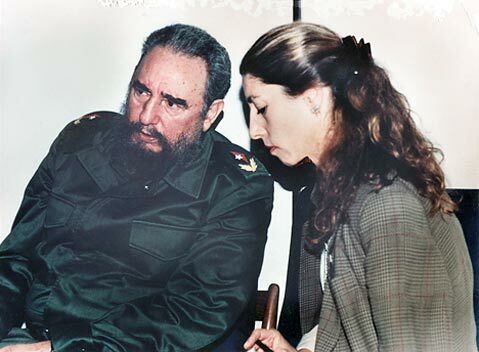 <strong>With Fidel: </strong> Ann Louise Bardach talks with Castro in January 1994. "Few men have so zealously pursued longevity as Fidel Castro," Bardach writes in her most recent book about the Cuban leader. The federal agents had come to her home seeking tapes and files from Bardach’s extensive reporting and interviews with Luis Carriles Posada, an anti-Castro Cuban exile who has a long history of involvement with the CIA, South American intelligence agencies, and deadly violence targeting El Comandante’s regime. She avoided the feds that day, but the nationally acclaimed author has spent much of the four years since fending off aggressive efforts by the Justice Department to draw her into a Byzantine tangle of political intrigue, clandestine deception, and legal combat between Posada and the government. The story of how Posada and his exile confederates conducted a decades-long anti-Castro insurgency is one of three compelling tales Bardach tells in Without Fidel: A Death Foretold in Miami, Havana, and Washington, her latest book on Cuba and its singular leader. Paired with Cuba Confidential, her 2003 portrait of the dictator and the island nation he rules, Without Fidel cements her stature as America’s best-informed and most insightful writer about Castro’s 50-year reign and the fervid passions, plots, and politics of Washington and South Florida aimed at destroying it. “In contrast to Fidel, an unsentimental man obsessed by politics and ideas, Raul enjoyed a life filled with friends, outside interests, and deep loyalties within [the army] as well as the family,” Bardach writes. Bardach’s close-in looks at the Castro brothers bookend “The Fidel Obsession,” the middle and most intriguing section of her book, which recounts and unravels the conspiratorial history of the anti-Castro exile insurgency, a rich story of secrecy and scheming in which Luis Posada plays a central role. Bardach was part of a New York Times investigative team in 1998, reporting about Miami’s Cuban exile community, when she received a surprise call from Posada, inviting her to come interview him in Aruba. A fugitive, he had escaped from prison in Venezuela, where he was to be tried for the 1976 bombing of a Cuban passenger plane that killed all 73 people on board, the hemisphere’s deadliest act of airline terrorism until 9/11. During hours of taped interviews, Posada acknowledged involvement in anti-Castro bombings. The tapes led to sensational front-page stories for the Times; they also set the stage for her to become a principal player in a drama she had previously viewed only as a reporter. In 2005, Posada suddenly turned up in Miami, walking the streets and living openly-until Bardach broke the story of him slipping into the country. Her piece embarrassed the Bush administration, which appeared to have a double standard in adopting a laissez-faire attitude toward terrorists whose deadly acts were aimed at an enemy of the U.S. More shameful still was a second Bardach exclusive, reporting that the FBI had inexplicably destroyed its intelligence dossier on Posada two years before. After publication of these stories, pursuit of Bardach’s Posada investigative files became a near-obsession for Justice Department lawyers, who said they needed the materials for a shifting series of cases. One still current involves perjury charges based on contrasting statements from her interviews with some Posada later made to immigration officials. Since 2005, the government has subpoenaed her four times in legal matters involving Posada, and she is likely to have to testify next year at a trial in Texas. 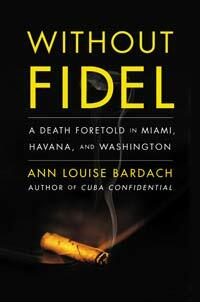 Ann Louise Bardach will sign copies of Without Fidel: A Death Foretold in Miami, Havana, and Washington on Saturday, October 24, from 3-5 p.m. at Tecolote Books in Montecito (1470 E. Valley Rd. ).